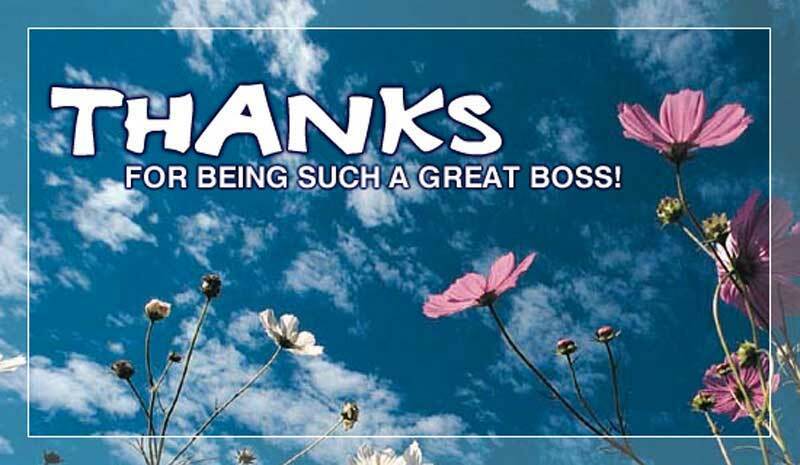 Thank You Messages For Boss : How to say thank you to your boss? Or what to write on the greeting messages for your boss? To help you with these, here we have arranged messages for boss, messages for boss farewell, messages to the boss for increment or bonus, or even simple thank giving message for gift. You can use these sample messages by writing them on the greeting card or sending them through text or e-mail. These words will symbolize your gratefulness towards him/her for the motivation, inspiration, guiding, encouraging and support you experienced from him/her. Dear Sir, you have excellent abilities of leadership and we’re so lucky to have an understanding boss like you. Thanks to you for your support and guidance. Working with a superlative boss like is the best experience of our career. Take our heartiest thanks for your excellent leadership. 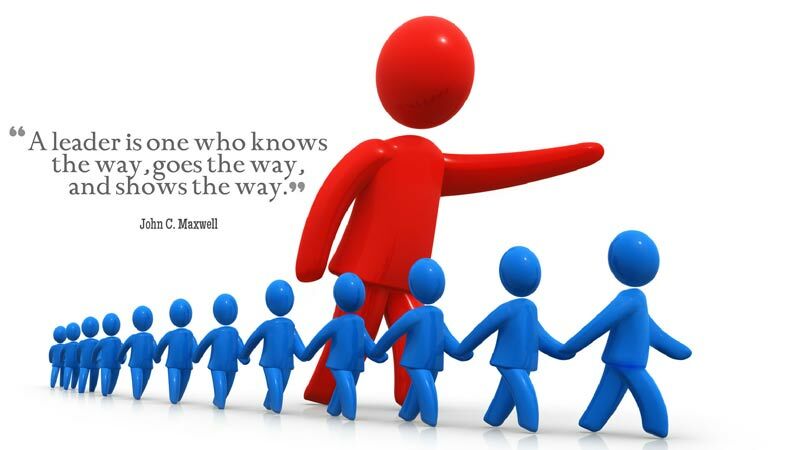 A leader not only shows the way but also walks the way with the team that you proved in real. You’re an amazing boss and we’re proud of you. Thank you. Working with a boss like you is a great inspiration for me that will help to keep modifying all my skills and talent. Thank you for all your support. 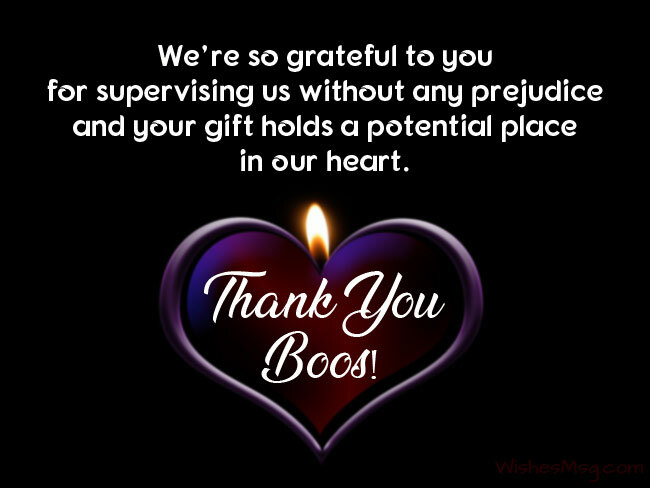 We are thankful to you for not doing any favoritism while supervising us. Your prerogative guidance is the key to the success in our career. We are grateful to you for directions instead of ordering; thankful for giving us a vision instead of targets; proud of you for your inspirational and one-of-a-kind guidance. Being your subordinate was the best training I ever had in the corporate world. Thank you for everything, boss. I learned a lot from you, and forever it will be treasured. Thank you, boss! I hope more employees will learn from you. Words can neither qualify nor quantify how helpful your guidance and advice has been. I am forever grateful for your support! Thank you, boss! You’re a fabulous mentor who understands correctly what his employees need and when. Thanks for modifying our talent and skills into a success story and taking care of our needs by allowing increment. We’re grateful to you for supervising us with fairness and inspiring us to work hard with a bonus allowance. Thank you, boss. To us, your leadership means a lot and you know really what a good boss means. Thanks a lot for the allowance of bonus. You’ve been always a mentor than a commanding boss and know our cordial gratefulness for your caring towards us. Thanks a lot for this year increment. Dear boss, you’re the sunshine that shows the path of a successful career and we want to let you know that you’re the secret behind our any achievement. Thank you for the bonus! We’re so grateful to you for supervising us without any prejudice and your gift holds a potential place in our heart. Thank you, Sir! Thank you so much, Sir, for this pretty token of affection from you. This gift will symbolize your magnificent leadership. No wonder you’re the best boss but the gift of yours prove that you’re a nice human being. Know our heartiest thanks to you. We can’t resist ourselves from showing appreciation at your gifts to us. Thank you so much for caring for us. Your gifts are as wonderful as your leadership and guidance. Know our heartfelt thanks for the gifts. We’re so lucky to have a kind-hearted boss like you who cares for us so much. Thank you, Sir, for your beautiful gifts to us. Your guidance and advice helped brighten my career and professional life. Thank you for being the best manager in the world! Thank you for making me feel like I am a friend that like I am an employee. You are great in dealing with your workers. Thank you, sir! You have been a great manager, mentor, teacher, and guide. Your support and advice have helped shape my professional career. Thanks for being the best boss ever! Your company expertise, reliability, and even goodness generate a good and enjoyable place to work. Many thanks for extending your passion and adaptability in times one of us of your staff needs a day-off. Thank you. The success I’ve had in my career is due in no small part to your support and encouragement. I appreciate you so much and value everything that I have learned from you. Working for you is an honor, working without you is an absolute horror. Working under you is a pleasure, an experience that I will truly treasure. Thanks, boss. It really feels so amazing working in your positive environment. Working under your management is indeed a great opportunity for an individual like me. Thank you! While I still have the opportunity, let me thank you for all that you have done not only for me but for the whole department. You are the most supportive boss we ever had. Thank you for everything. We have learned from you so many things that gave betterment in our journey of a career. We’ll miss a friendly boss like you always. Thanks for your principled guidance. You’ve been always like a friend to us and working with you was an amazing experience that we’ll forever cherish. Farewell! We wish you a retired life full of grandeur and thank you for bestowing us with so many inspirational lessons. Dear boss, we’re going to miss you a lot as you’re the superstar of this office and thank you for supporting us with where we lack. Farewell, dear boss! Your leadership is a significant experience through our job life and we’re grateful for your kind concern and guidance. You’ve been always more than a boss- someone in whom we could intimate and now that today is your farewell, we’ll always miss that supervision. I just want to express how much I appreciate you as my boss. Being my boss and leader has a great impact in my life. You inspired me in so many ways. Thank you! Dear boss, I show my appreciation for your enduring support in the last project and thank you for the promotion you handed me. I am much grateful to have a supportive boss like you. Thanks for being our manager and role model. We appreciate all the knowledge and skills you’ve imparted to us. Thanks for being a great leader! As we continue to work with your day by day, we begin to understand and appreciate your vision for the company. Thank you for always being supportive of our creative projects. Thank you is a small word, Because under your guidance, I have learned so much from you, All the things old and new, You are a great support for sure, Thank you so much! Your commitment to quality of work is contagious. Because of your example I seek to perform to the best of my abilities. A big thank you boss, for the guidance you have provided me on the deal project. I am really thankful and appreciate your effort and guidance all the way. You have been a really helpful and special person. Showing thankfulness to your boss and appreciate for all the guidance and mentoring could be more easy by the use of these messages. 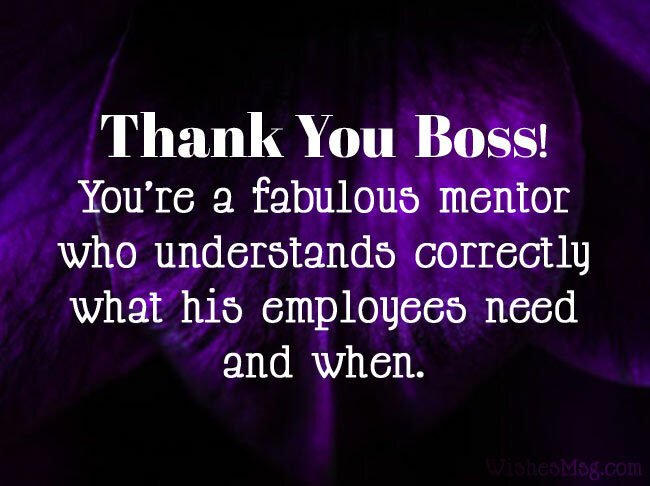 To honor your boss you may send a thank you letter or a thank you note to express your gratitude for his/her great impact on your professional life. 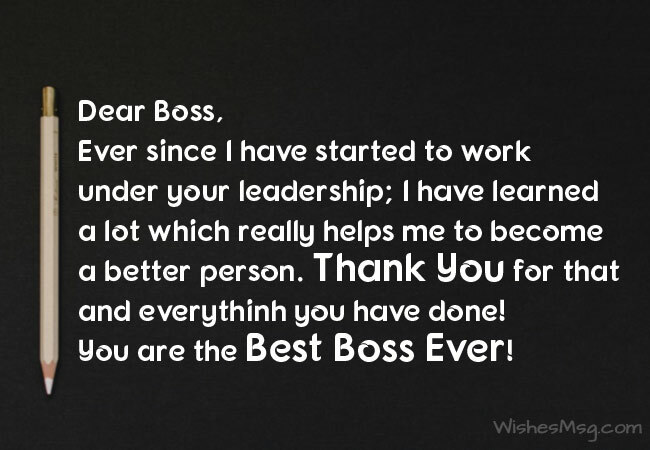 Even it will be very good if you attach an inspirational leadership quotes along with a best thank you message for boss. If you stuck with what to write in a thank you card then just take ideas from these thank you messages and notes to write your own. You may send these thank you messages and notes via social media like Facebook, Twitter, Pinterest or Email which you feel more appropriate to use.